Today’s vehicles are being designed and manufactured with much more sophistication. As a result, technicians require much more training and education to properly service them. We stay abreast of all the latest technologies and equipment to keep up with current standards. Carlisle Air Automotive’s technicians are highly qualified and able to use electronic diagnostic equipment for all makes and models. Our advanced equipment is also able to service your check engine light. If your check engine light has popped onto the dashboard, you need to get it looked at asap. While a check engine light is no time to panic, it’s also no time to procrastinate. When owners delay their check engine light repairs, there is no telling how much damage they could be doing to their vehicle. That is until it’s too late. There are a variety of electronic components within your vehicle that are connected to the engine’s operation, transmission performance and more. Our team stands behind all of its repairs to your vehicle. There’s nothing to worry about when you bring your vehicle to our facility for electronic diagnostics or repair services. Even after you leave, your expert technicians have your vehicle covered with a competitive service guarantee–24 Months / 24,000 Miles. Electronic diagnostic services should be left to the professionals at Carlisle Air Automotive in San Antonio. Our team has decades of auto service experiences, since before electronics were a major part of vehicle manufacturing. We’ve continued to add more training, skills, and equipment to our expert facility. 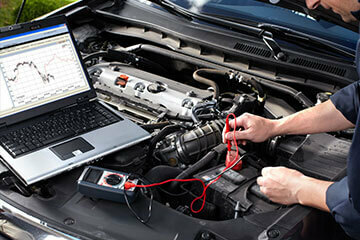 Top-notch electronic diagnostics are how we ensure safe and efficient road travel for your vehicle. Keep your vehicle’s electronic components in working order. Leave it all to our experts and you’ll continue to enhance your driving experiences. Your vehicle needs a careful inspection of its engine, mechanical, and electrical systems. We make sure your vehicle’s electrical components are always in excellent condition when you bring your vehicle to Carlisle Air Automotive. The engine and other vehicle components are directly connected to electronic and computerized systems. Repairs can be complicated and expensive when owners try to service them on their own. You need the right equipment and the right training to perform any electrical system repairs. We keep our services quick, complete, and affordable. That goes for our top-of-the-line check engine light repairs as well. Give us a call today at one of our convenient service locations–North San Antonio (210) 558-1020 or South San Antonio (210) 922-5991–to schedule an electric diagnostic service.